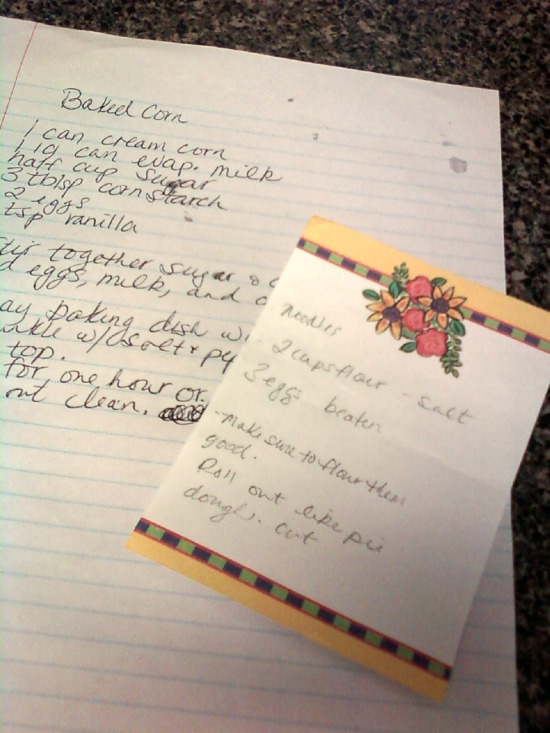 Time to add some recipes!! I've got a day off, all the cleaning is done (kinda) and I'm able to sit down and love all on my blog. Woo hoo!!! As I said before, I was going to come back and give you guys the recipes for the baked corn, the homemade noodles, as well as the yummy chocolate chip cookie dough truffles I made for Jess.. So here I am, and I'm getting down to business! Sadly, I do not have photos of any of the recipes, I do however have people who can vouch that I indeed made them, I ain't no liar ;) and that they taste pretty good. It is a fact that I will make them again, oh yes. When I do, I will most definitely post the photos!! Preheat overn to 350 degrees. Stir together the sugar and the cornstarch, add eggs, milk, vanilla, and corn. Spray a baking dish with cooking spray, Pour in corn mixture. Sprinkle with salt and pepper, and about 5 slices of butter. Bake for one hour or until knifer inserted, comes out clean. Mix flour and salt together in large bowl. Make a well in center, add the eggs. Mix together until dough forms. On well floured surface, continue to knead the dough. Seperate into 2 balls. Roll out like pie dough, about an 1/2 thick. Cut into long noodles. Cook as desired. The notes I took at Jason's Grandma's house during Christmas! Cream the butter, sugars, and vanilla together until light and fluffy. Add flour and salt, mix utnil just combined. Add milk until blended well. Fold in chocolate chips. Oooooo gosh, all of the peeps in your life who are cook and bake for are so lucky to have such TLC!! !